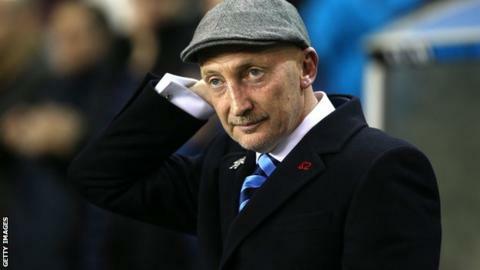 Ian Holloway says Millwall still have an uphill battle as they look to avoid relegation from the Championship. The Lions beat Wigan on Tuesday to move within two points of safety, but 21st-placed Charlton have two games in hand. "It is a shame we have run out of games and there isn't much margin for error," manager Holloway told BBC London 94.9. "We will keep fighting right until the very end. We've still got a mountain to climb and we'll keep climbing. That's what we'll do." The 1-0 victory over the Latics followed up the 2-1 win at Nottingham Forest on Saturday and meant Millwall secured back-to-back wins for the first time since September. Holloway took over at The Den in January and won in his second match in charge, but the 51-year-old has tasted victory just three further times in the subsequent 15 games. However, successive victories mean the Lions are now three points behind Blackpool and four adrift of Doncaster and Birmingham, albeit with an inferior goal difference. "The togetherness and spirit has come and the players have gone back to feeling confident and wanting to implement what we have been talking about," Holloway said. "Over the last couple of months it was coming and then it dropped off a bit. But it is coming back again right at the most vital time. "Against Wigan some of our football was excellent and I think we deserve it. I'm sure our fans will be as proud as I am. "This group of players is really proving to me that they want to play for this club and dig in." Millwall welcome Watford to south east London on Saturday and Holloway says they need the total support of their fans in order to achieve a positive result. "Let's see if we can produce as fear-free a performance as we have done in the last two away games," the former Blackpool and Crystal Palace boss said. "I need our fans to help me with that and get right behind us and try and terrify Watford, in a nice way. "If any of my boys gives a bad pass they didn't mean to I don't want it hurting us. "It's no coincidence it is two great performances on two great pitches. Hopefully we can do that at our own ground."